"We are all moving through this constantly. We all had so many emotions penned up after the other albums." Prepping for interviews usually come with mixed emotions; A mix of nervous curiosity, angst, excitement and anxiety, asking the correct questions, getting the best and up to date info and wanting the artists to be relaxed with you. I have been fortunate enough to usually be in the presence of artists that are cool to be around. Some bands or artists take a liking to you for whatever reason and treat you more like good friends and family. 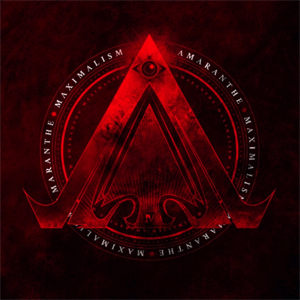 Knowing I’m going to be able to see AMARANTHE live again is awesome in itself but knowing I’m going to chat with them and hang out for a bit gives me that feeling of seeing long distant friends or family that are traveling into town for the day. Every member of AMARANTHE is amazingly sweet, funny and entertaining. I absolutely love each member. I was able to speak with Elize Ryd and Olof Morck the night of the North American Tour kick off in our very own Houston, Texas in February. As soon as I walked onto the tour bus they all gave me hugs and remembered exactly who I was (rare). So very grateful to their management for setting KNAC.COM up again to work with them. KNAC.COM: Hi guys! Thanks for setting aside a few minutes to chat with me. RYD: Thank you for talking to us again! MORCK: No, thank YOU! Happy to see you again. KNAC.COM: I can’t believe you guys remember me, very humbling! RYD: We remember your boss Larry (Petro, the News Monkey). Very nice man and we remember you coming to say hi after the interview last time because you couldn’t get there in time. KNAC.COM: That was 2 years ago almost, wow. Yep that was me!! So this is your kick off show tonight for the North American tour. What are you feeling? MORCK: Just excited to get our latest album out there and want our fans to hear it live. We have 19 shows before going to Canada. RYD: (big smiles) I love our new album Maximalism. KNAC.COM: I have to say there are some different sounds on this album. You can’t just classify it as metal or hard rock. I hear many sounds in the composition of the music. There is a song that shows off all these sounds on this album, "Supersonic". It’s hard with a mix of operatic rock, so many sounds. MORCK: It’s a reflection of our insanity. KNAC.COM: I like that!! Reflection Of Insanity, that’s a title right there! MORCK: Yes that’s a title, good one! RYD: All of our personalities get to come out. Our other interests in our personal lives help with creativity. KNAC.COM: I have to say my absolute favorite song on this album is "Endlessly". I think it's going to be the song at my wedding if I get married again. In love with it. Who wrote this song? MORCK: Eliz and I both wrote the lyrics and music. Tell me if you decide to use this song for your wedding. We will send you a version that’s just string instruments and you can use it. KNAC.COM: Seriously? It’s really one of the most beautiful musically and lyrically! Listening to that track and others I sense that someone or maybe more than one of you guys have recently gone through something to do with relationships. Someone fell in love and possibly a relationship ended. I'm curious if I am on the right track. MORCK: Maybe a bit of both! RYD: (smiling at Olof) Yes you're correct, we all had been going through things during the writing of this album. MORCK: We are all moving through this constantly. We all had so many emotions penned up after the other albums. RYD: Yes you're right, all are all very personal. RYD: Yes, that hat! I don’t like that hat. KNAC.COM: I don’t like it either just because at the last show I couldn’t see his eyes in photos! MORCK: There you have it, no more hat Adams! RYD: Cara (Halo) doesn’t like your hat! ADAMS: I will give you the evil eye tonight (snickering). RYD: I’m gonna steal it, the hat! KNAC.COM: I’m sure that’s exactly what he is saying (insert sarcasm). I think I’ll just steal it on the way out! MORCK: Cara (Halo) steals things from the tour bus (laughing)! Just playing! KNAC.COM: So is there is anything else you want your fans to know about this album? MORCK: Yes, well like you said, the music is so diverse and personal. When we sat down to write it we wanted a personal album with more diversity and wanted an album not so streamlined as the other albums. It was a challenge but we want our fans to hear new sounds. 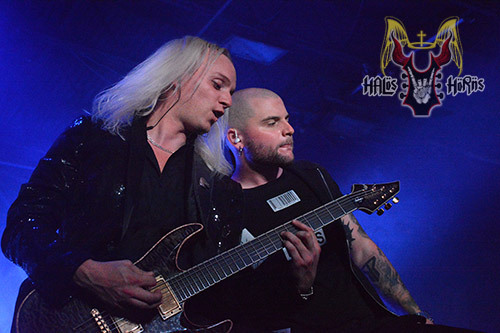 KNAC.COM: Thank you much, this was a blast. I love you guys!! MORCK: You're welcome, we appreciate the support KNAC.COM gives us and you personally. RYD: Yes, thanks for sharing our music on your pages, we notice!! KNAC.COM: Well we at KNAC.COM love you guys. Hope to see you all soon! *Side note, Chris Adams did not wear his hat! I won!!! Lol!